On an early Sunday morning, the organizing committee walked through Arena Green in preparation for the first ever Moving Day® Silicon Valley event on Saturday, April 25. We had the verdant and tranquil park all to ourselves, and I tried to imagine what it would be like filled with hundreds of people. Over breakfast, the committee members reported on the activities of the day, which included a first of its kind salute to Parkinson’s scientists and doctors. An epiphany came to me over the cinnamon rolls. I began to see what faith and follow-through could do. I wanted to fill the blanks in the canvas. I wanted more people to walk with me, to participate and to celebrate movement. Something amazing happened as I reached out to friends and neighbors to join or support the walk. They began to fill in my picture of the day and our imagination was becoming a reality! This little illustration that I drew for children to color on the day of the event is titled “Imagining Moving Day® Silicon Valley.” It expresses for me, more than words could, what I see and feel about Moving Day®: joy, cheer, celebration, friendships old and new, teamwork, kinship, new community, validation, hope and going the distance. 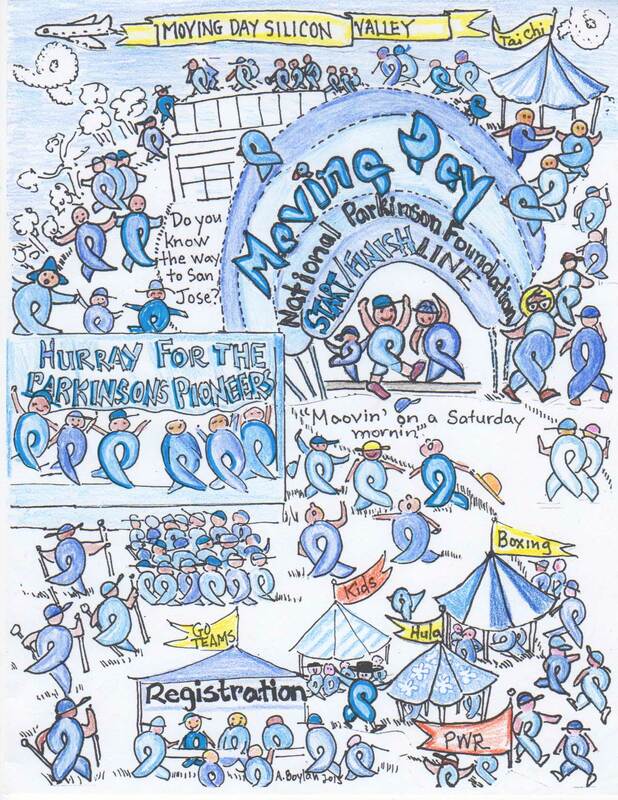 As I sketched, I turned the blue ribbon of the National Parkinson Foundation into people, bluebirds, and clouds. The blue ribbon shapes became people who tiptoe and dance, stride and sashay. Pole walkers kick up their heels and tai chi-ers raise and aim their feet. In my imagination, my NPR pin has become a little spirited Parkinson sprite! As I asked friends to join me on the Moving Day® walk, I had to tell many of them for the first time, that I had been diagnosed with Parkinson’s disease. Moving Day® has given me a very positive way to connect with my friends. If they aren’t able to attend the event, they have donated their generous support. The Moving Day® website has been a great method to check with people and provide them with an easy connection to register or donate if they wish. The fundraising growth of our team is due to the selflessness of friends and to the magic ripple effect where friends of friends have responded. I encourage people to spread the word and to invite others to join us. Our team has grown and the gift our team will give to National Parkinson Foundation has grown from a couple of hundred to a couple of thousand dollars. So much is accomplished when good people join together! Register for the event at www.movingdaysiliconvalley.org. For information, contact Colleen Fischer, Moving Day® Bay Area Coordinator, National Parkinson Foundation at 925-421-6737 cfischer@parkinson.org. For more information about the National Parkinson Foundation, please visit http://www.parkinson.org or call 1-800-4PD-INFO (473-4636). You are blessed to have my cousin, Ann Boylan, aboard! 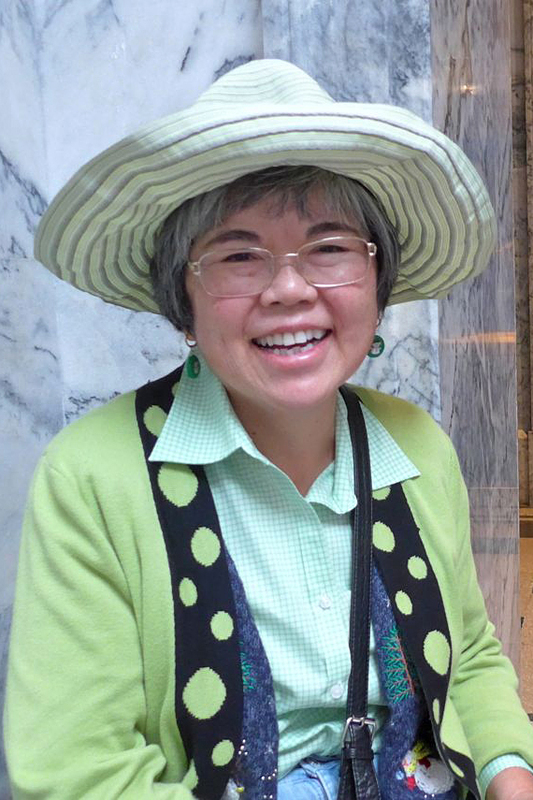 One day there will be an award, building, organization, or statue named or built for this former Northern California teacher of the year! She is quite a wonderful and great lady!